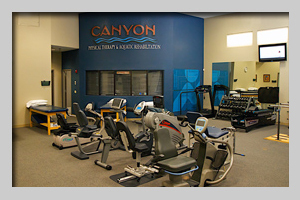 At Canyon Physical Therapy & Aquatic Rehabilitation take pride in every aspect of your treatment, your health and well being is our first priority. Are you looking for a way to maintain your exercise routine? Are you looking to adopt a more healthy and fit lifestyle? Then our Wellness Program is for you! To establish a warm, receptive and non-intimidating environment that facilitates and enhances your experience. A state of the art gym with the best quality equipment available for fitness conditioning and strength training. A heated saltwater pool with a variety of exercise tools to perform both buoyant and resisted exercises. Come join us! Have fun and the best part is that it’s for you and your health!